Aerial view of the Vobster area (click to enlarge view). The pretty village of Vobster is situated just north of the Nettlebridge valley, seven kilometres north-west of Frome. Its rural tranquility belies an industrial past at the heart of the Somerset Coalfield. This area of Mendip contained both coal mines and stone quarries which were working up until the 1970s. The Vobster area lies north of the Beacon Hill Pericline and is underlain by highly contorted and faulted Coal Measures. In places, the Carboniferous rocks have been so severely folded that they have been overturned on themselves to form a recumbent structure known as a nappe. Here, the Carboniferous Limestone which forms the 'nose' of the nappe has been thrust over the younger Coal Measures. The isolated knolls of Carboniferous Limestone in Lily Batch Wood, Luckington and Soho are also nappe structures. North of Mells, the Carboniferous rocks are unconformably overlain by the gently dipping Jurassic Charmouth Mudstone and the Inferior Oolite. The higher ground of Mells Down and Kingsdown forms an escarpment of Great Oolite strata. The masses of Carboniferous Limestone around Upper Vobster were worked for aggregate but closed in the 1950s. One of the quarries, Vobster Quay is now flooded and is used as an inland diving centre. The Coal Measures contain thin coal seams, some of which have been worked. Many small collieries and pits were worked around the area; the main pits being Vobster, Vobster Old, Vobster Breach, Newbury and Mells collieries. None of these were very profitable and they were all closed down in the late 1800s or early 1900s with the exception of Mells Colliery which was operational until 1943. The site of Newbury Colliery is now an industrial area, but the winding and pumping engine houses still stand, as do the colliery offices. Little remains at the other collieries apart from a few spoil tips, except for Vobster Breach Colliery where the remains of two banks of coking ovens can be seen. Most have now collapsed, but approximately 12 remain intact although now seriously overgrown. Map of old collieries, quarries, tramways, railways and canals (click to enlarge view). Several old canals, tramways and railways sprang up to serve the coal mines and quarries. The earliest scheme was a canal through the Nettlebridge valley, linking the Somerset coalfields with the woollen mills of Frome, and to link with a proposed Bristol to Poole canal. In the end, only about 13 km of canal was cut and the Bristol–Poole canal never materialised. In 1803 the work was abandoned, but the line of the canal can still be seen just south of Vobster Cross. 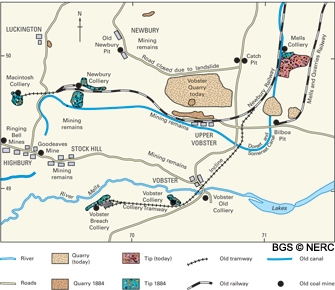 The Newbury collieries were connected by rail to the broad gauge Great Western Railway in 1857. It ran close to the route of the Somerset Coal Canal, and in places used the old canal bed. A narrow gauge tramway was laid to connect the railway with the pits in the Nettlebridge valley to the south. Part of the tramway, which is now followed by a footpath, ran along an inclined plane just east of the pub in Vobster.